I have had a box of Conquest Games' new Norman Infantry for about a week. A quick review: if you have their cavalry, buy this box. You will have more than enough troops for a SAGA warband, and you're more than halfway there for a decent sized non-skirmish game. I am currently leaning towards Clash of Empires - haven't tried Hail Caesar, though. For about $30 USD, you get eight sprues with five bodies. 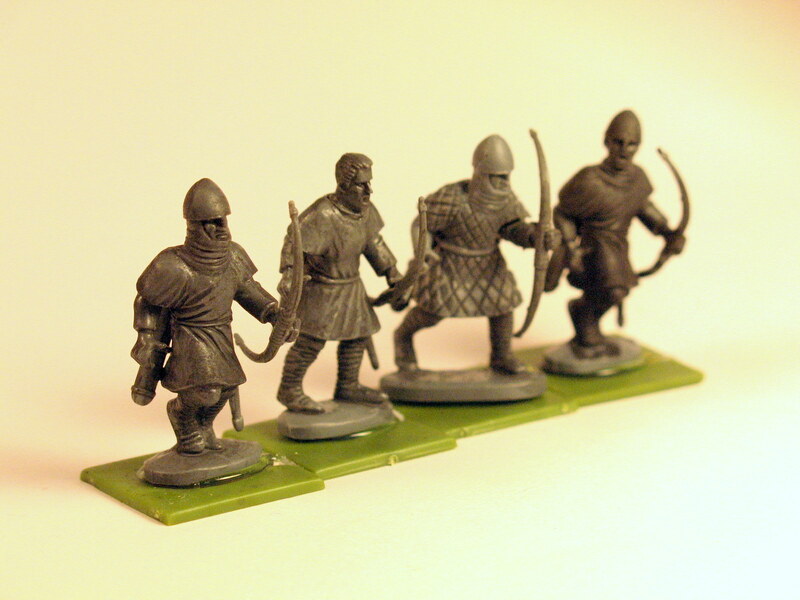 Three bodies are unarmored, one is in a gambeson and one is in knee length chain mail. Two command sprues contain a leader in chain and an unarmored musician/standard bearer, and a dead knight. The models are crisp and well molded with a minimal amount of flash. The line of flash going up the leg wrappings can be difficult to smoothly remove. I have two small criticisms with the set. Overall, the sculpting is excellent, though I do not really care for unarmored fellow who is in an awkward half-run pose. He doesn't make a good spearman and with a sword in his hand he looks like he is about to trip. And while the set contains plenty of weapon options (spears, swords, two handed axes, kite shields and round shields), it contains no bows or crossbows. As levies are the weakest SAGA troops, it can painful to pay metal prices for 12 archers when there are plastic options available for warriors and hearthguard. 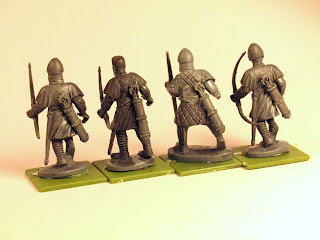 It's a disincentive to adding levy units to your warband. 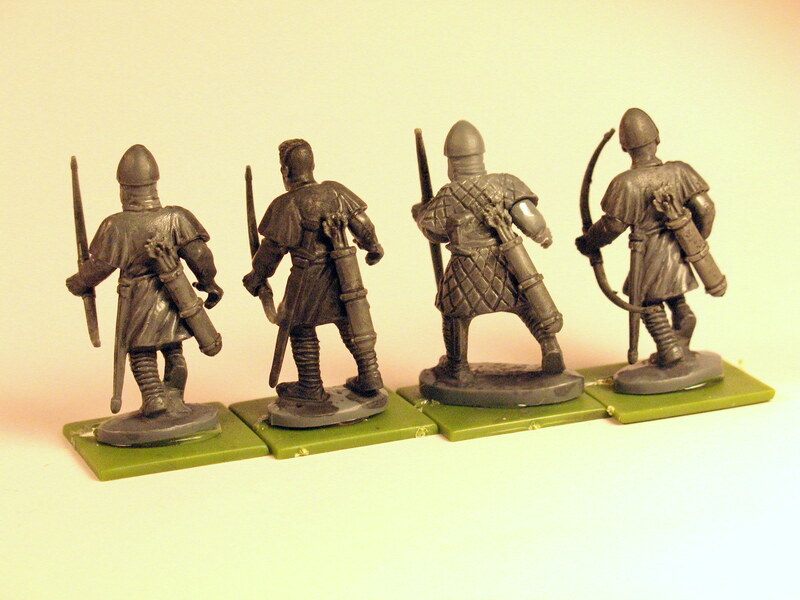 My solution was to add in arms and bows from some bits left over from a box of Wargames Factory Saxons. 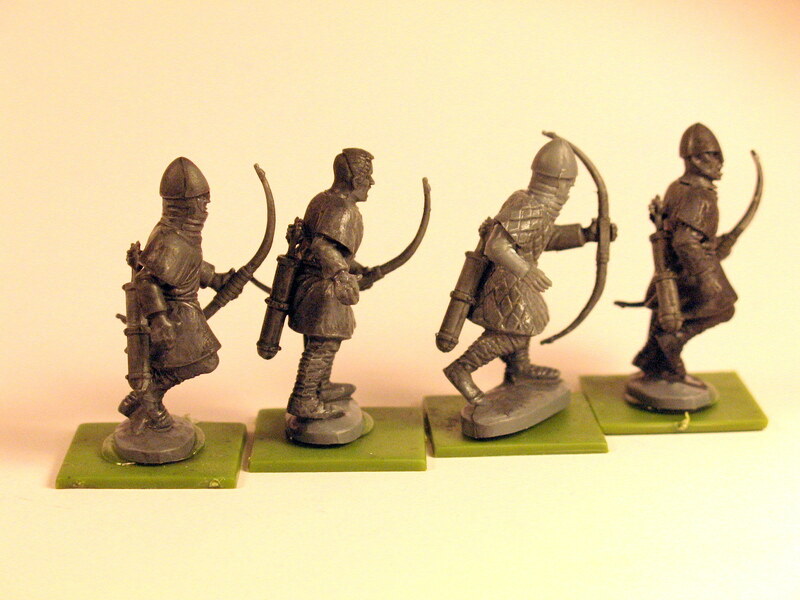 Here are four Conquest Games infantry converted into archers, and given a black wash to highlight details. 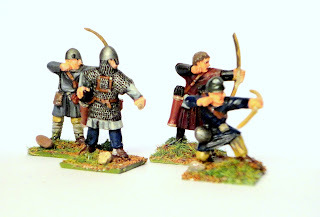 The posing is not ideal for archers, but they might fill out the ranks behind a good set of dedicated metal Norman archers. Neither of those critiques should bar one from buying a box or two if a Norman army is your desire.